This propellant is highly versatile, and has shown exceptional accuracy in .223 Remington, 5.56mm, and .308 Winchester. It is similar in burn speed to Accurate® 2520, CFE™223, Reloader®15 and IMR 4064. It holds the broadest utility across all moderate rifle propellants. The propellant gas generation rate is appropriate for cartridges of the light to heavy sectional density .223 Remington and .308 Winchester. It can load the 55 grain, through 77 and 80 grain .223 REM. It loads the 150, 168 and 175 grain .308 Winchester, and loads all .30-30 combinations. It works in .30-06, in 7mm-08, 6mm BR, 6mm PPC, .204 Ruger, and similar cartridges. The burn rate and geometry of this powder yields low residue, and ample port pressure to cycle AR, M1, M1A, G3 and G36 systems. The flow characteristics of this propellant enable the loader to volumetrically dump charges within +/- 0.1 grains. 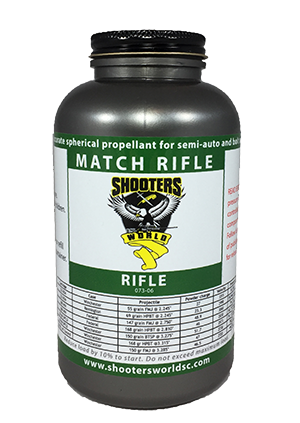 Match Rifle is a canister form of Explosia bulk and canister propellant D073-06.